The University of Virginia. Charlottesville is a college town, with a beautiful and historic campus, also known as “grounds,” and a strong academic community. The Historic Downtown Mall. One of the largest pedestrian malls in the country, the Downtown Mall features boutique shops, restaurants, cafés, concert venues, museums and more. 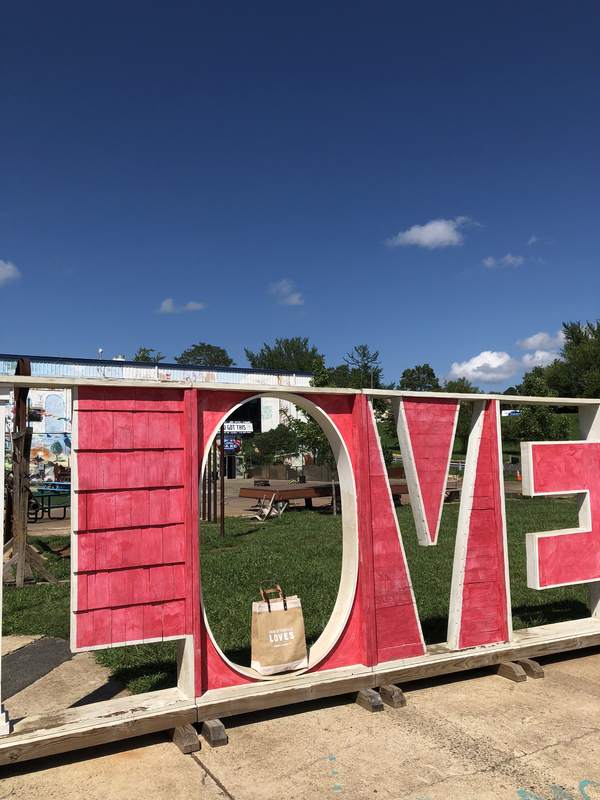 While we could not possibly capture all the things we love about Charlottesville in one blog post, these are a few of the places that make our area so wonderful. 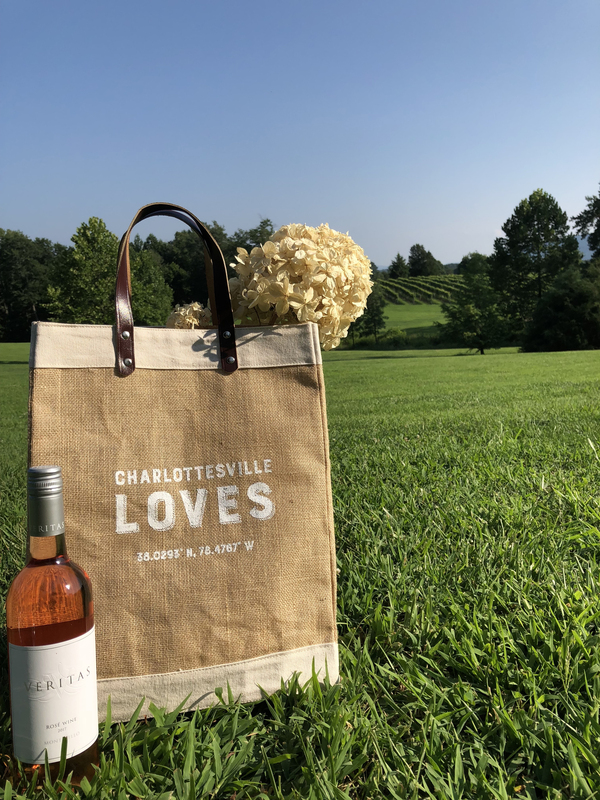 Be sure to check out our magazine, Charlottesville Wine & Country Living for a deeper look at life in Charlottesville and the people and places that inspire us each day. 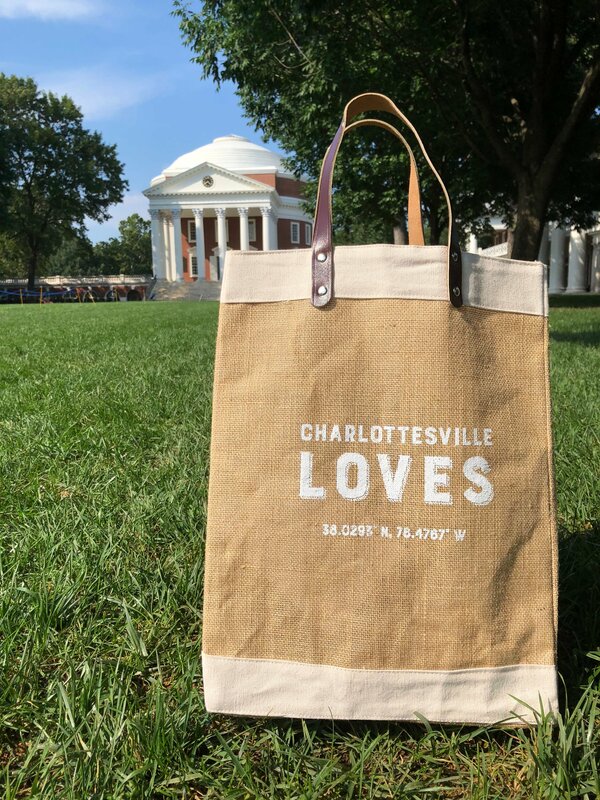 If you would like your own “Charlottesville Loves” bag, you can find them at Roxie Daisy, Darling Boutique, Lynne Goldman Elements, Finch or Verdigris. 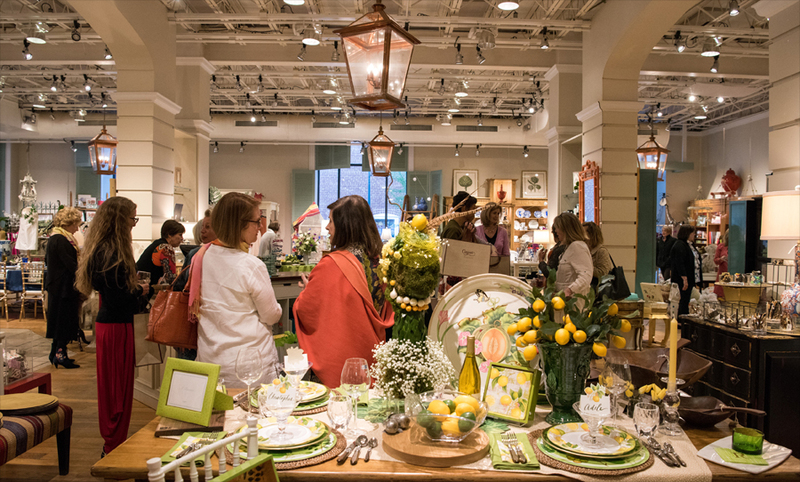 As we say so long to spring and hello to summer this week, we want to share one of our favorite events from this Spring—Caspari’s fabulous floral creations event during Historic Garden Week. Over the past 13 years, Caspari, a local retailer of stylish paper products influenced by a variety of materials—fine art, textiles, ceramics and interior design—strives to showcase the works and patterns of established artists and museums around the world. 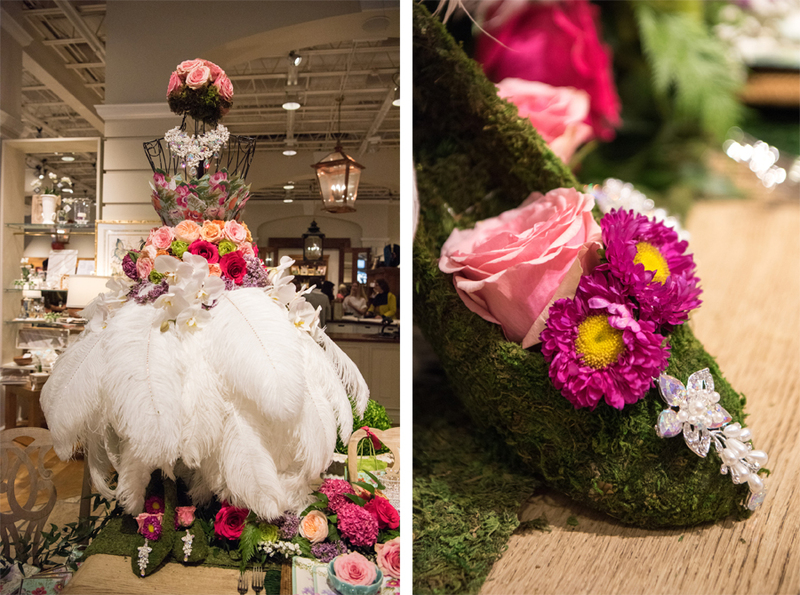 In continuing their vision, Caspari hosted its annual “Floral Fashion” event, where local florists artistically highlighted everything spring and summer have to offer. 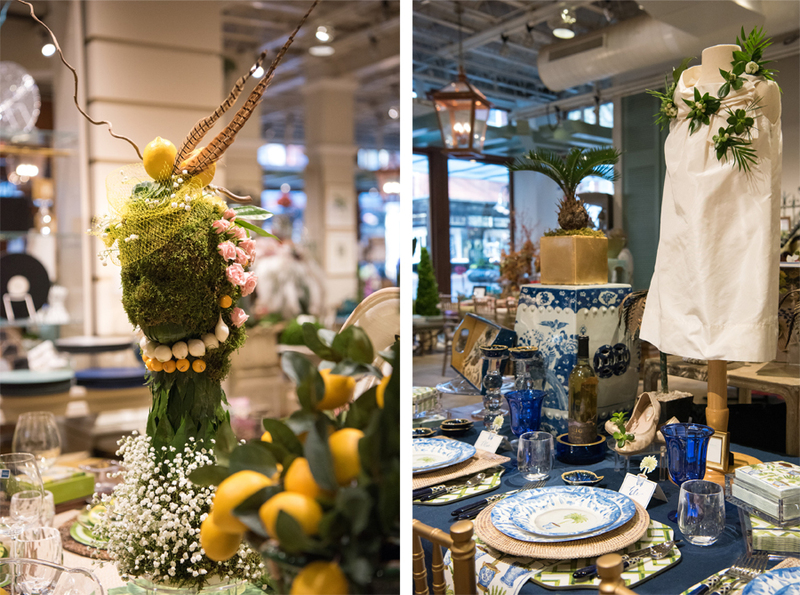 Pulling inspiration from Caspari’s stationery and accessories, each florist brought to life their own beautiful vision of artistic attire through unconventional ideas, styles and patterns. As guests wandered from one display to the next, they snacked on delicious cheese and crackers, crostini and fruit and sipped on wine, fulfilling all of their senses at once. A Pimento Catering (photo above and at left below), inspired by Caspari’s lemon-print items, combined different elements for their creative display. The cleaver fascinator topped with pheasant feathers was a charming feminine accessory pulled together with garlic bulbs and lemons, succulents, moss and feathers. 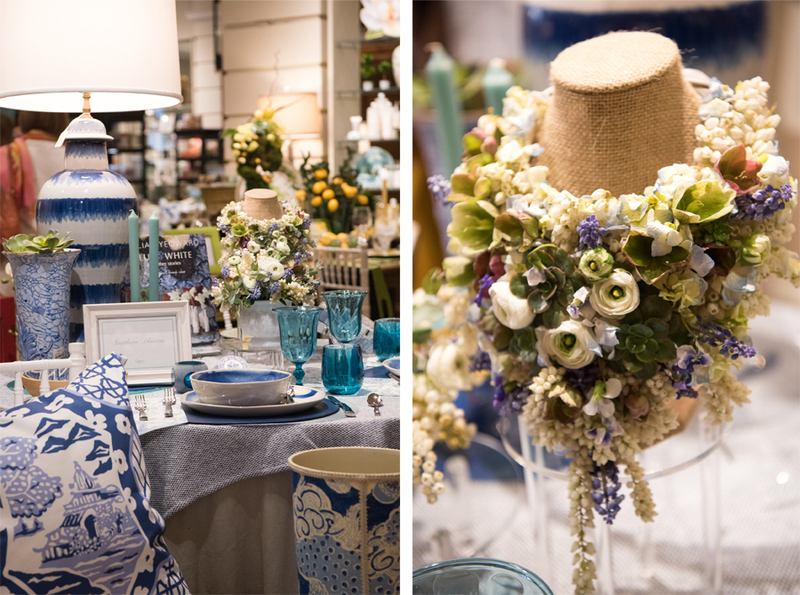 Stacy Torrence of Fresh (photo at right below) played off of Caspari’s blue and white dinnerware to create a lovely setting. Inspired by spring’s innocence before leading into summer, Fresh used jade plants on ballet slippers, greenery around a simplistic, yet classic, child’s summer dress and other minimalist floral elements that are sometimes overlooked when other plants are in full bloom. 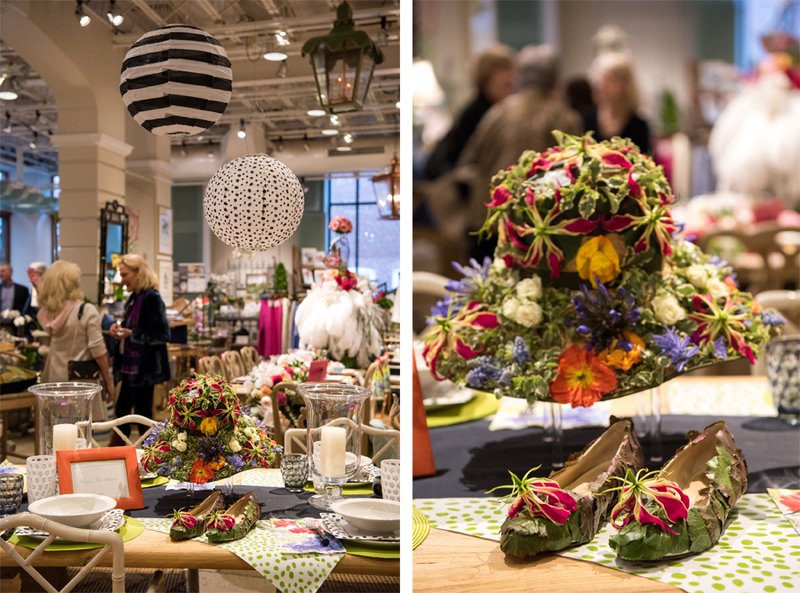 Floral Images Design Studio in Charlottesville (photos below) created a breathtaking display by using a variety of items. Their vision carries all the way from the rose hat to the moss-coated high heels topped with the same pink rose. Pearl earrings adorned the heels, complementing the stunning necklace. The bodice of this masterpiece, composed of Caspari napkins, leads into a rose festooned sash and white orchids before reaching its full-skirt, ball-gown style, crafted of white feathers. A spray of lilac was also added for a sweet spring scent. Gregory Britt with Tourterelle Floral Design (photos below) was festive with their garden-style arrangement. 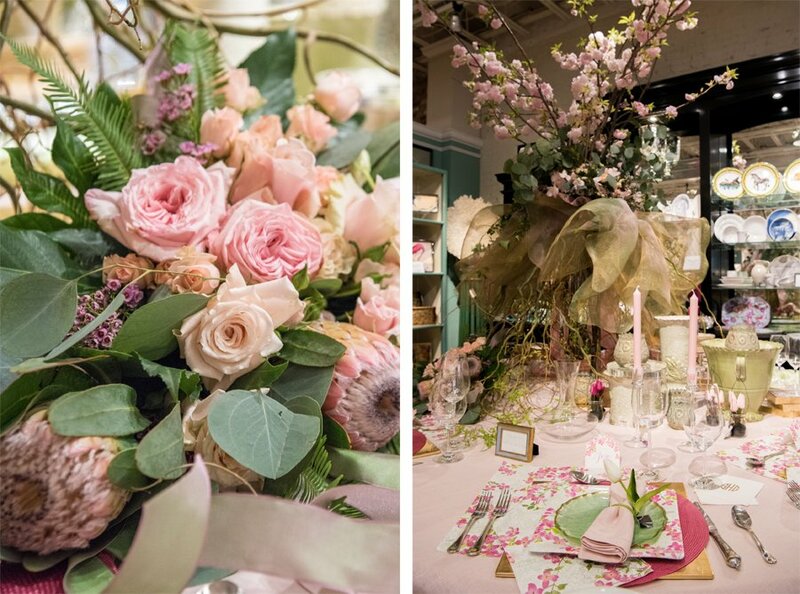 Stemming off of Caspari’s pink floral napkins and tableware, Tourterelle added sprays of cherry blossom and a custom hand-crafted tulle to incorporate the pretty shades of summer. Eucalyptus, ivory trailing down the skirt, roses, candles and protea were also used to display the softness of the season. Southern Blooms (photos below) pulled in the bold, yet soft, style of Caspari’s products to pair with this gorgeous securely fastened, floral collar necklace. By using grape hyacinth, delicate shades of lavender and purple, many hues of green and chartreuse, white roses and ranunculus, Southern Blooms brought to life an envy-worthy adornment. Hedge Fine Blooms (photos below) inspired all with their tropical-inspired hat and ballet flats. Using orange poppy, white roses, variegated and grape hyacinths with chartreuse flowers, Hedge created botanical accessories that speak to a heavenly oasis. Pharsalia (photo at left below) gave guests a highly structured display comprised of blue and orange hues, reminding us that the garden is beautiful year-round. Designed to show the natural growth of the stems, this dramatic arrangement of greenery, bittersweet berries, dried hydrangea and seed pods paired well with seashells, dried flowers and moss. Whereas, Blue Ridge Floral Design’s display (photo at right below) grew from the inspiration of Caspari’s pink and green-themed paper items. A sash of pink and a white rose belt cinched the waist of a bodice of large tropical leaves before dropping to a skirt decorated with bows that resembled delectable ribbon-candy. 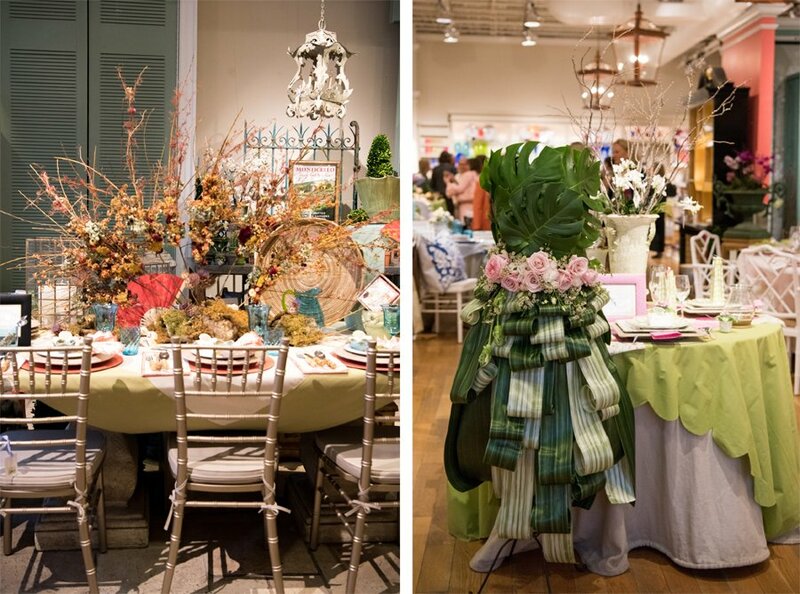 Once again, Caspari’s “Floral Fashion” event was a successful affair, and we were grateful to be in attendance. Movers and shakers in the local garden industry came together to celebrate not only the local florists who help lead Charlottesville’s identity in artistic fashion, but also Virginia’s Historic Garden Week, known as “America’s Largest Open House.” We look forward to seeing the amazing creations at next year’s event. 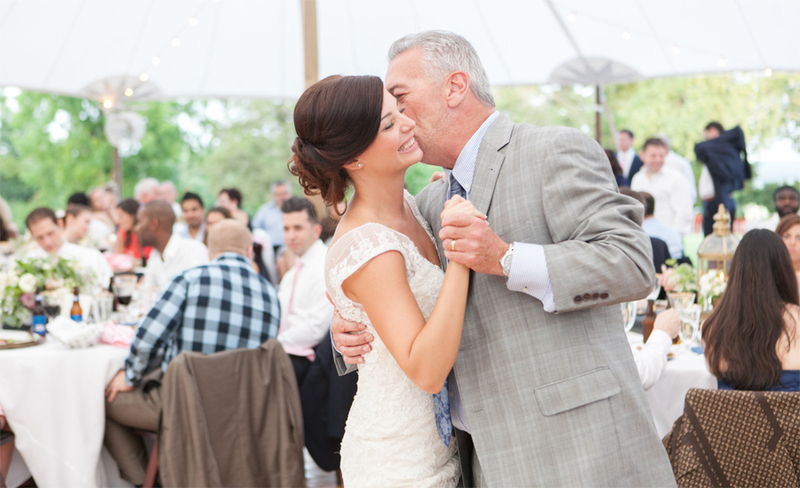 To help remind Dad he’s one-of-a-kind this Father’s Day, pick him up something local and unique. Whether you plan to spend the holiday golfing, fishing or visiting one of our beautiful local wineries or craft breweries together, these gifts are sure to be the icing on the cake. 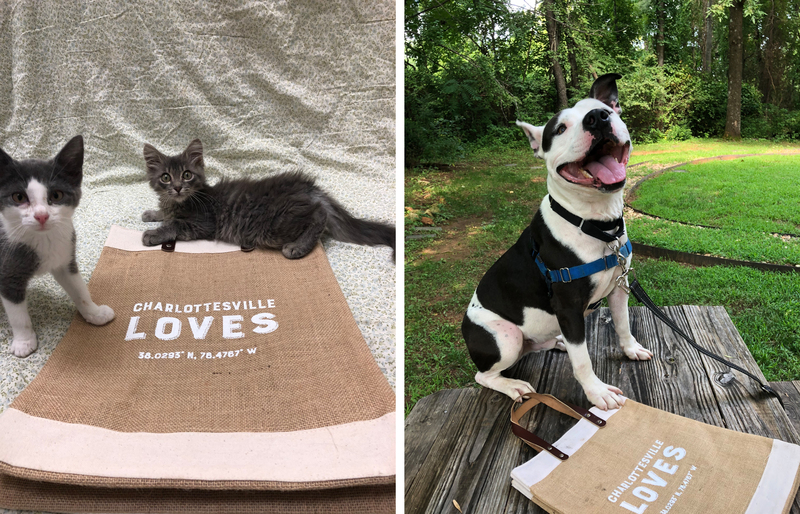 For the best of local events and happenings visit the Charlottesville Welcome Book . 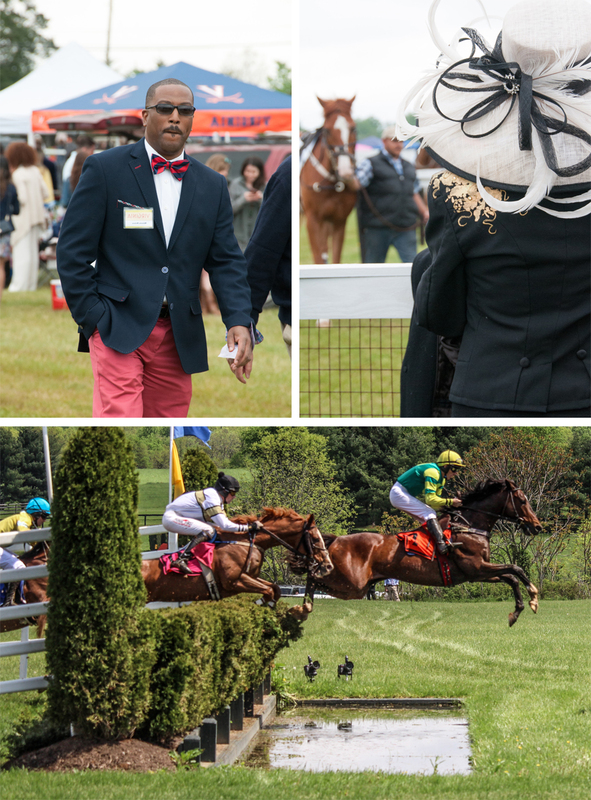 Each spring and fall, Virginians don their “afternoon dress” or “Sunday best” to celebrate the state’s steeplechase tradition with posh horse races. Social affairs, these events are filled with fashion and tremendous tailgate spreads, complete with lawn games and farm-to-table food and drinks. The sport is one of elegance and beauty as equestrians race over lush fields and hills. 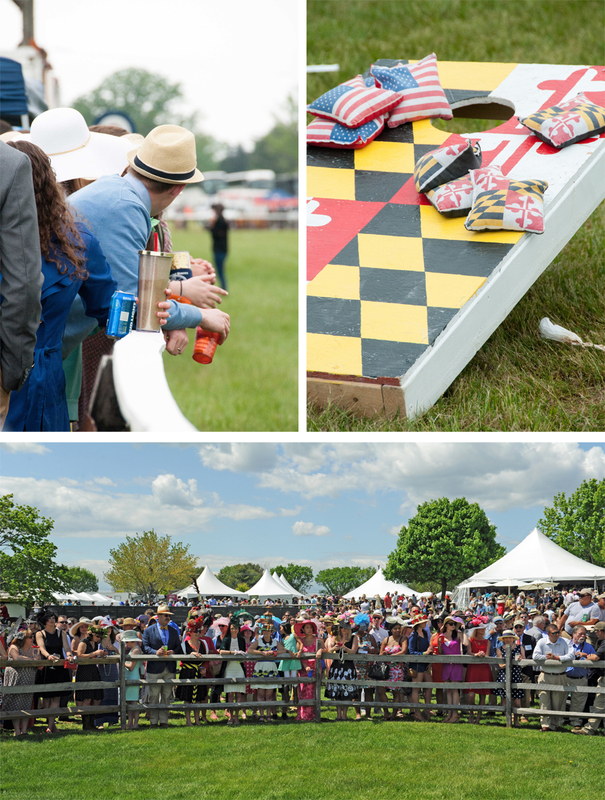 This season, the custom continues with the Foxfield Spring Races on Saturday, April 28, and the Virginia Gold Cup on Saturday, May 5. The proximity to the horses on race days make for an exhilarating experience. Reaching speeds around 45 miles per hour, the horses test the limits of speed and agility and tradition includes spectators placing friendly wagers on their favorites and then raising their glasses to the fastest. In addition to the competition on the field, hat and tailgating contests are added entertainment. No matter the season, this 250-year-old tradition continues to excite and entertain equestrian lovers. Be sure to check our Facebook and Instagram for special ticket giveaways for upcoming races. To learn more about Steeplechase, click here. Scroll on to see our horse race fashion guide! 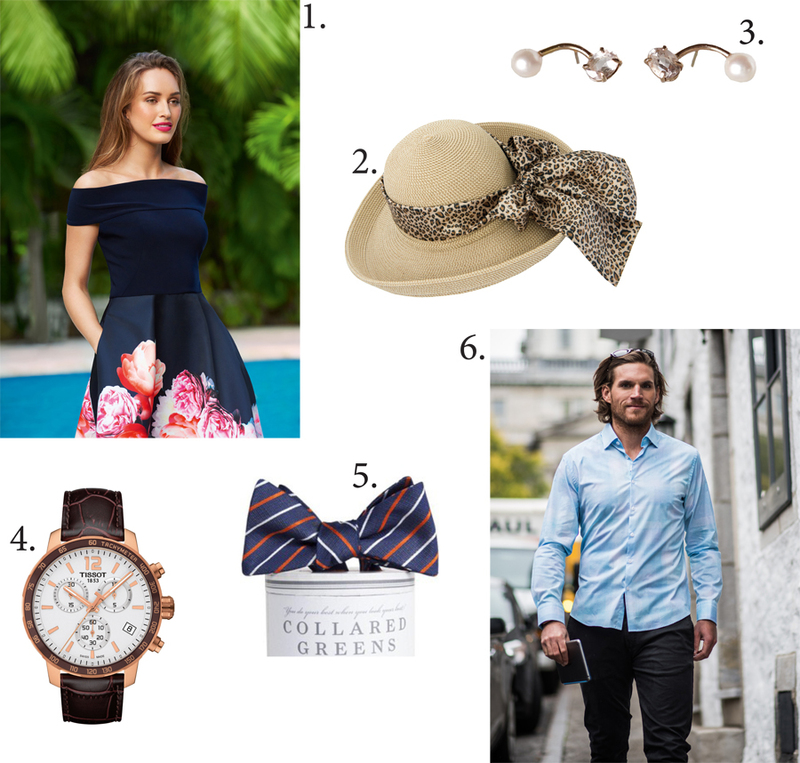 From broad-rimmed hats embellished with lively accessories to bright seersucker suits, the preppy fashion showcased at Virginia horse races is always a staple of the events. 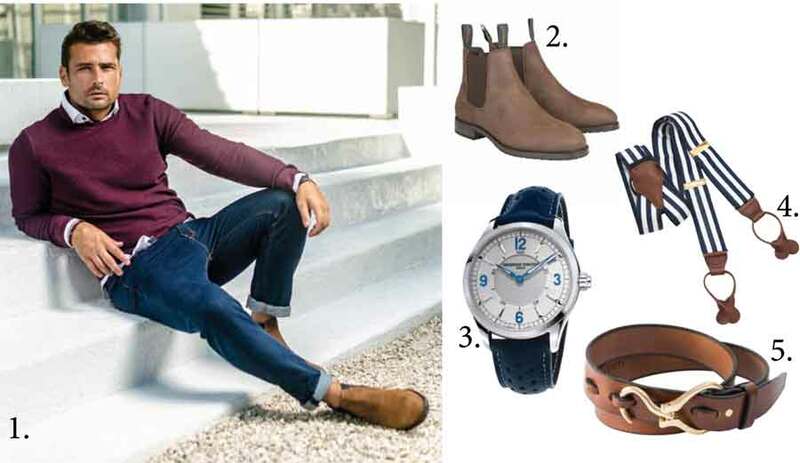 We put together some of our must-have pieces to help you plan the perfect look. 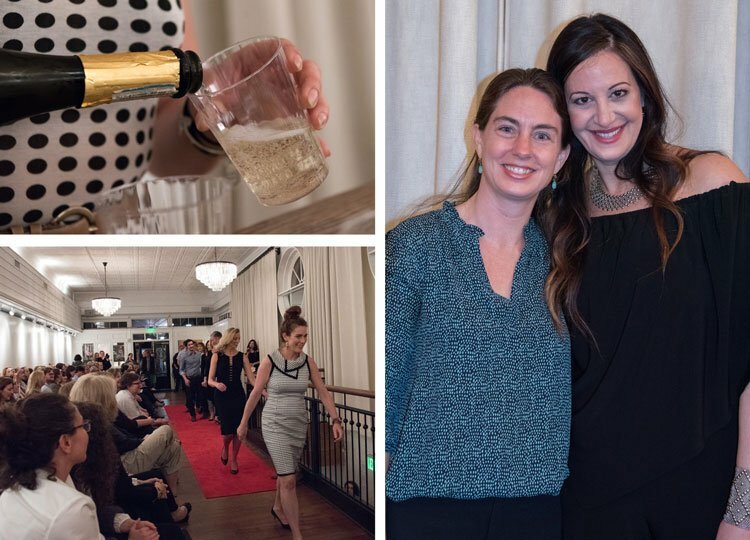 Thursday evening, Charlottesville Wine & Country joined a packed house at Old Metropolitan Hall in Downtown Charlottesville to see the latest spring trends at Verdigris Clothier’s celebration of fashion, women and the boutique’s grand re-opening. Owner, Mazi Ochayon, (seen below at right with Elizabeth Irvin, Executive Director of the Women’s Initiative at left) hosted a fabulous fashion show featuring their chic Joseph Ribkoff and Stone Rose lines while guests enjoyed sparkling wine and music. Joseph Ribkoff’s spring collection featured beautiful bright floral patterns and black statement dresses and tops, while Stone Rose showcased dapper pastel and patterned shirts. 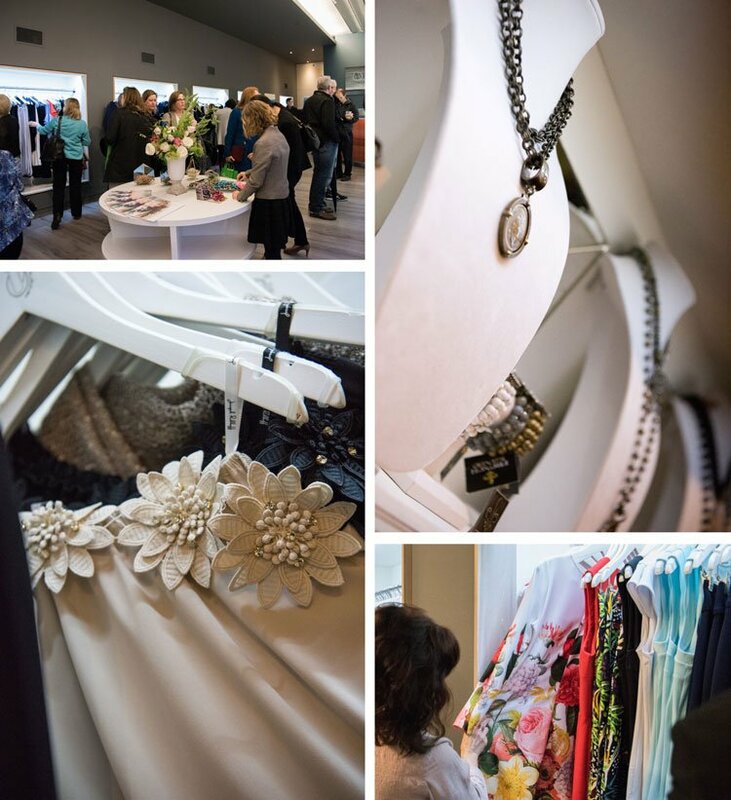 The event benefited the Women’s Initiative, a local nonprofit that works to empower women by providing them with effective counseling, social support and education. 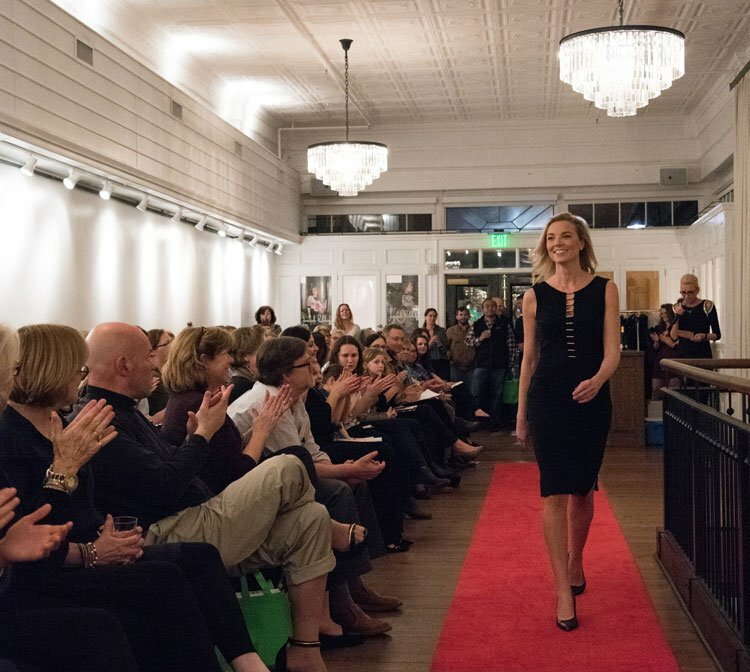 Following the fashion show, guests were invited to visit the stunningly refurbished Verdigris boutique next door, browse spring lines and enjoy hors d’oeuvres from local Brasserie Saison, C & O Restaurant and Hamilton’s at First Main. Guests mingled while discussing their favorite trends from the evening and trying on new looks for the season. 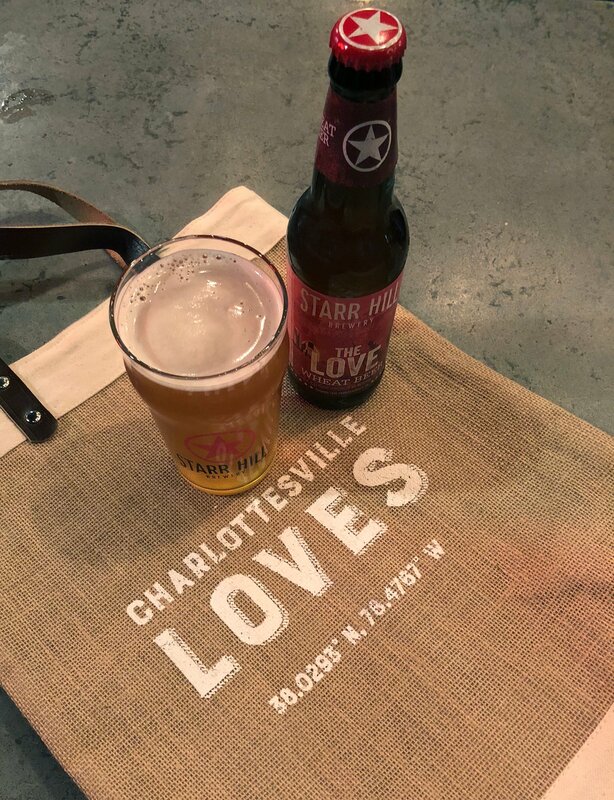 The event showcased the spirit of Charlottesville, bringing together professionals and community members in support of a local business and a wonderful cause. You can visit Verdigris at their elegant Downtown boutique or online to find spring pieces and be sure to check our CHO•ho Style section this spring for more of the latest fashion trends and must-haves. Are you looking for a Valentine’s Day gift? 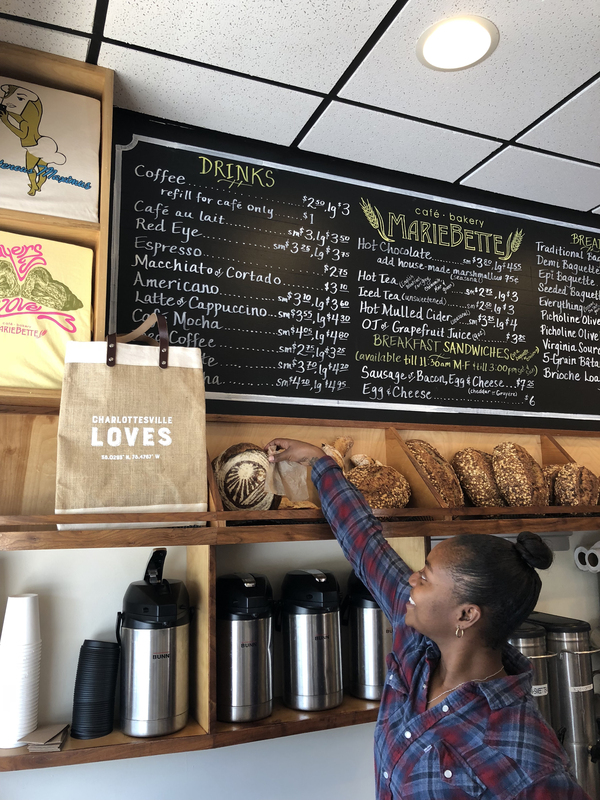 Here are a few local ideas we love. 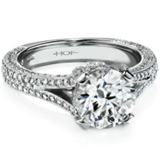 Purchase them for your loved one or use them as hints to help your significant other find the perfect present. 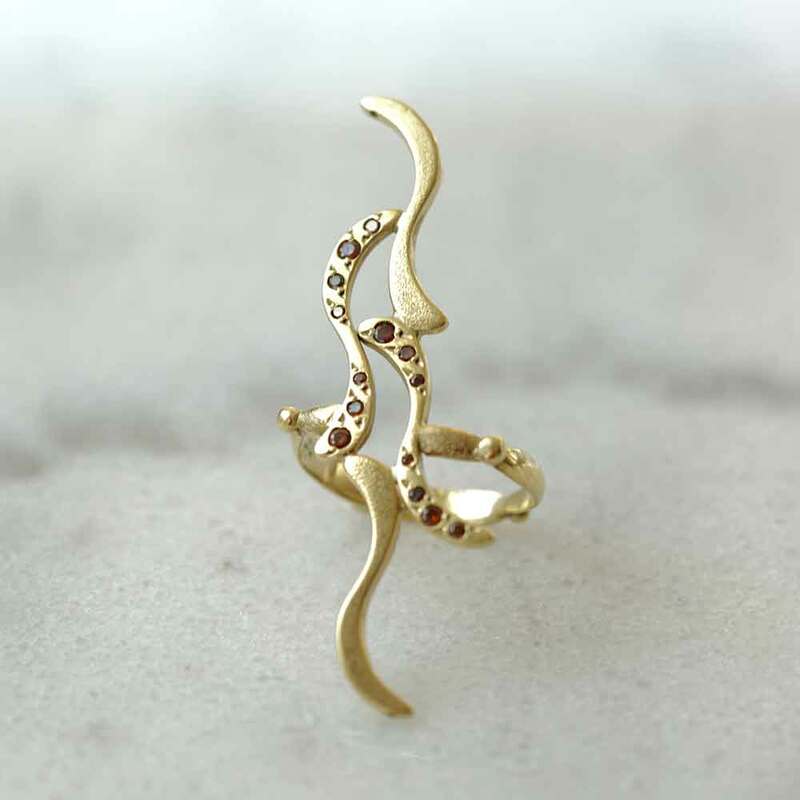 Artisanal Jewelry: Unique, hand-crafted pieces, like this stunning red diamond ring from Ana Cavalheiro Fine Jewelry, are sure to be timeless and treasured gifts. A Valentine’s Day Look: For the woman who likes to dress up, this is an excellent gift idea before an evening on the town—surprise her with a new chic dress, like this beautiful one from Verdigris. 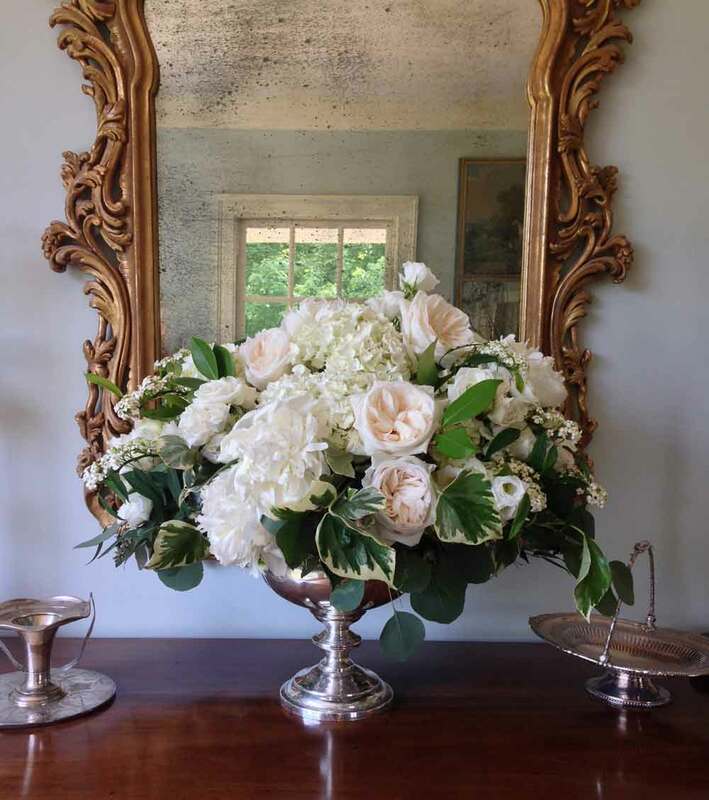 Personalized Floral Arrangements: While this may seem like a classic gift idea, talented floral designers, like those at Tourterelle Floral Design, can help you pick and/or design a spectacular arrangement that is sure to take your love’s breath away. A Spa Day: Guarantee your loved one the time to relax with this thoughtful gift idea. 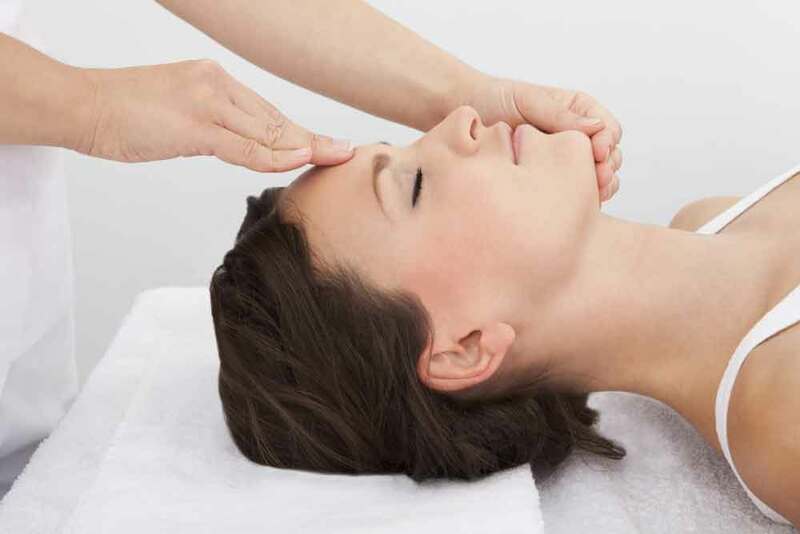 Consider one of our stunning local oases, like The Mill House Spa by Neroli at The Inn at Willow Grove or the Med Spa of Virginia Total Wellness Center. 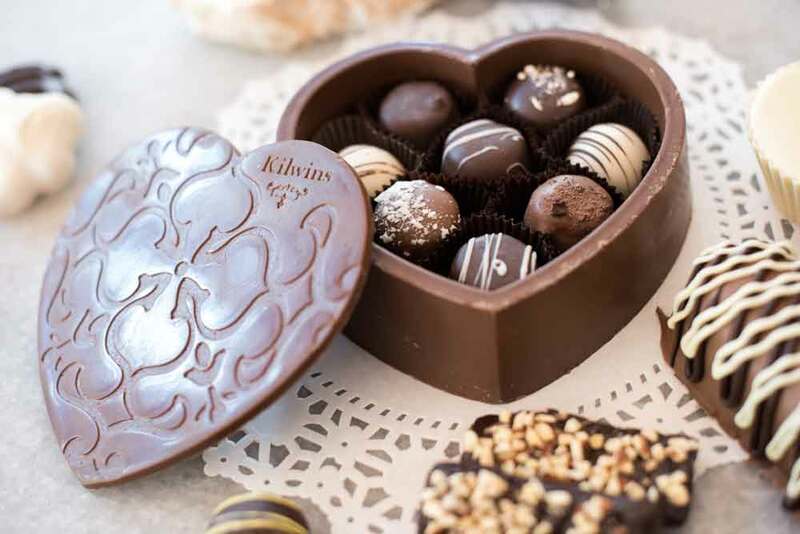 Artisanal Chocolates: Gone are the days of guessing which chocolates in your heart-shaped box will taste good when you order artisan, hand-crafted chocolates, like these from Charlottesville’s Kilwins. 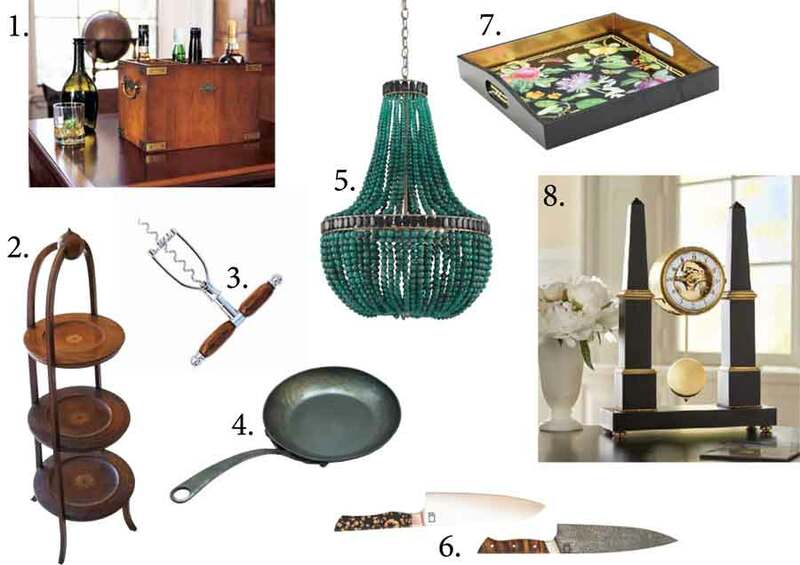 Be sure to also check out our CHO•ho Style section in the most recent issue for more gift ideas! 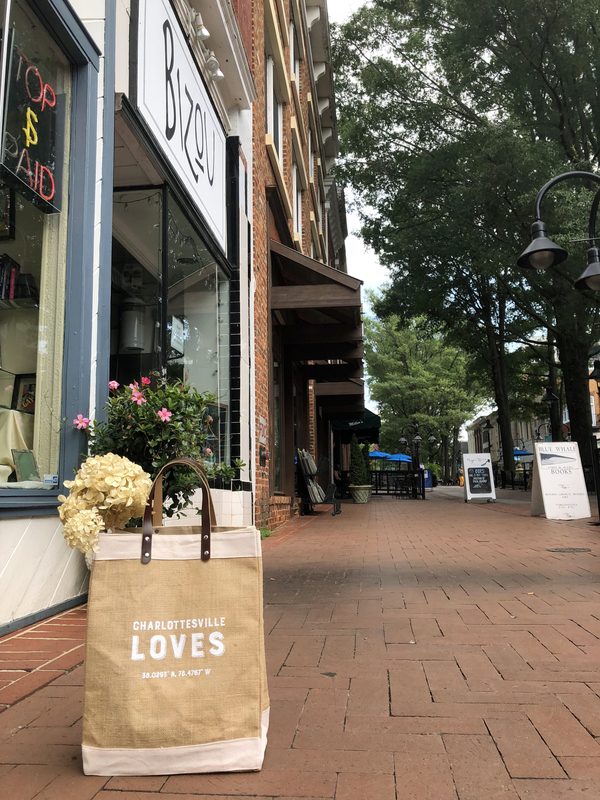 With all of the amazing stores in Charlottesville, it is easy to find something for everyone on your list this season. Here are some of our favorite CHO•ho Style items for the home, for her or for him to help make your search a little easier! You may even find something for yourself. Be sure to check out our CHO•ho Style section in each book of Charlottesville Wine & Country Living for more of our favorite local finds! LAGOS Bracelets & Rings: We love the intricate detail in each masterpiece from the LAGOS “Caviar” collections. 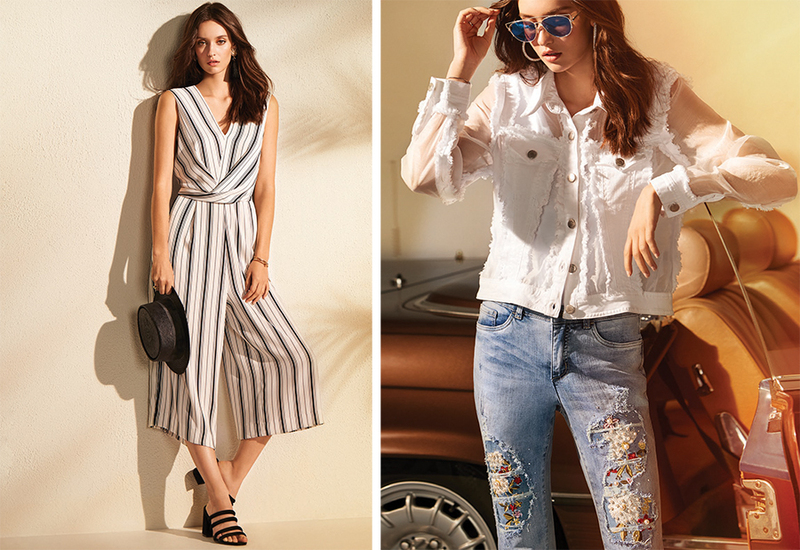 These pieces are sure to stand out from your attire. 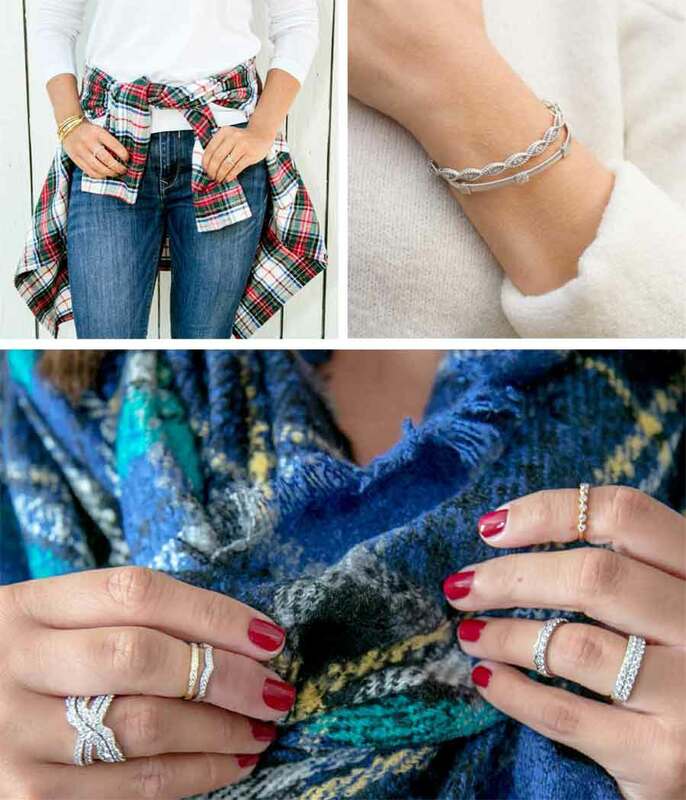 Hearts on Fire Diamond Rings and Bracelets: These dazzling diamond pieces (below: top left and bottom) look amazing when stacked with other bracelets and rings, and can add the perfect touch of glamour to any look. 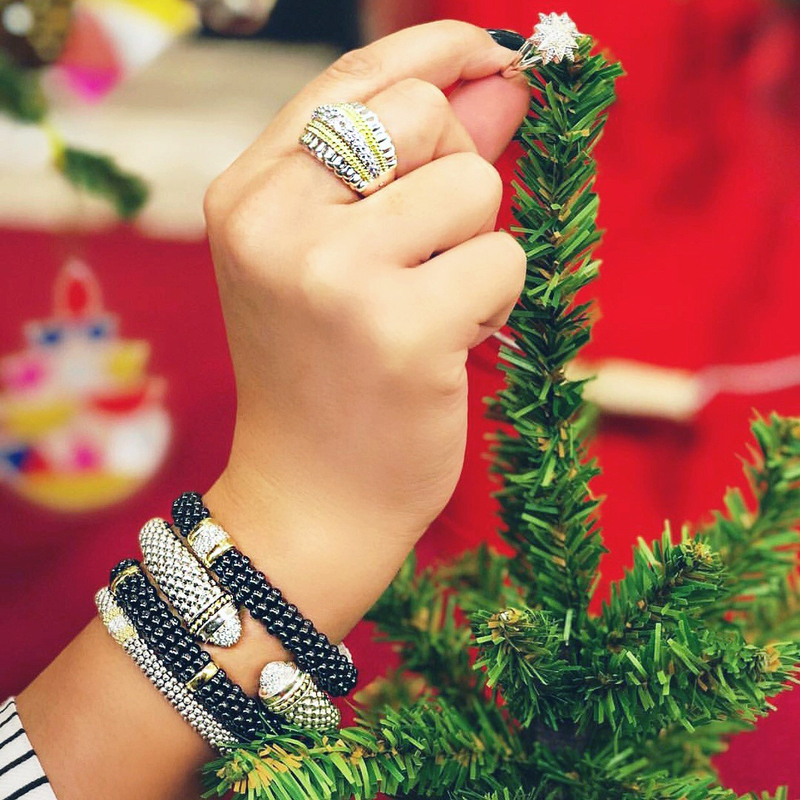 Roberto Coin and Marco Bicego White Gold Bracelets: The chic Roberto Coin bangle bracelet with 0.50 carats of diamonds and the Marco Bicego “Masai” hand-engraved bracelet with 0.21 carats of diamonds (below: top right) help create a classic and effortless holiday ensemble. Marco Bicego Yellow Gold Necklace: The perfect finishing touch to your casual outfit, the Marco Bicego 18K yellow-gold hand-engraved “Jaipur Resort” necklace has rose cut cushion mother of pearl. 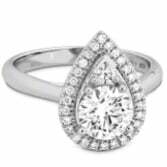 For more jewelry, or to find these pieces, visit Schwarzschild Keller & George. 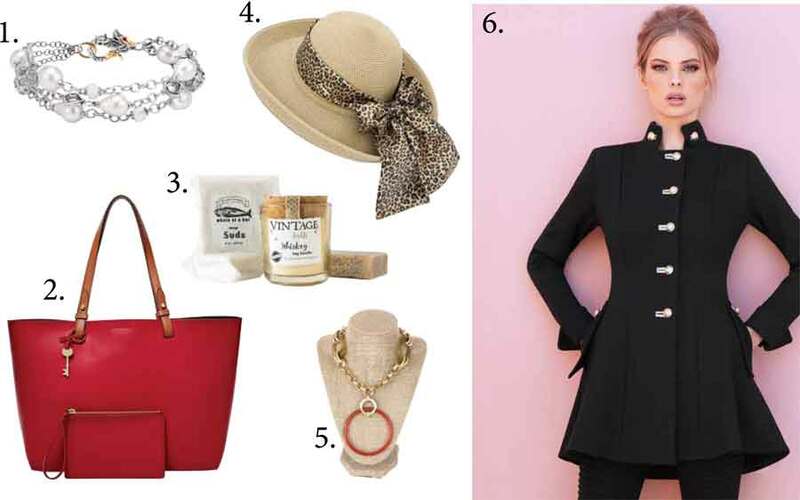 Be sure to also check out the CHO•ho style section of Charlottesville Wine & Country Living for more fashion.